…I think the cover of this month’s Inspired really sums up November, stark, grey and quite possibly drizzly. The cool, damp weather gives us the perfect excuse to snuggle up in cosy coats and jumpers and enjoy the crisp, cold air though, or alternatively turn the heating up, curl up on the sofa with this month’s magazine and enjoy a feast of winter inspiration. A big, big thank you this month has to go to our contributor, the lovely Karin Ridgers, for her reviews and interviews. 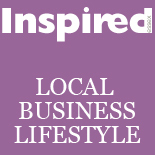 Karin is the creator of VeggieVision ( http://veggievision.tv) and a regular guest on Radio Essex , so she’s a great addition to the team at Inspired! There’s rather a lot of sparkle in this issue, to brighten up the dark evenings. Glitzy gold and silver furniture, party wear and accessories combined with brightly coloured beauty trends are just the antidote, and if you’re feeling a bit ‘grey’ yourself, fear not as we’re packed with expert tips and tricks on how to become a ‘Winter Warrior’. …if you need a cuppa to go with your mag, we even have pages dedicated to coffee culture, with everything from mugs and coffee makers to swanky tables to perch them on. We’d love to hear from you if you have any thoughts, comments or ideas about the magazine. This entry was posted on November 21, 2012 by inspiredessex in Magazine.